A south Wales seaside town has been a sea of quiffs and blue suede shoes as thousands of Elvis Presley fans descended for an annual celebration of The King. 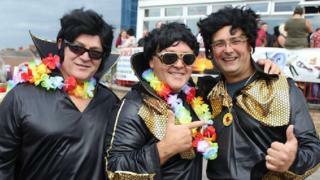 The Porthcawl Elvis Festival features 50 tribute acts performing more than 100 shows as well as the Elvies Awards. Seventy photojournalism students from the University of South Wales have been there to capture the colourful characters who flocked to the resort. The festival runs for three days.